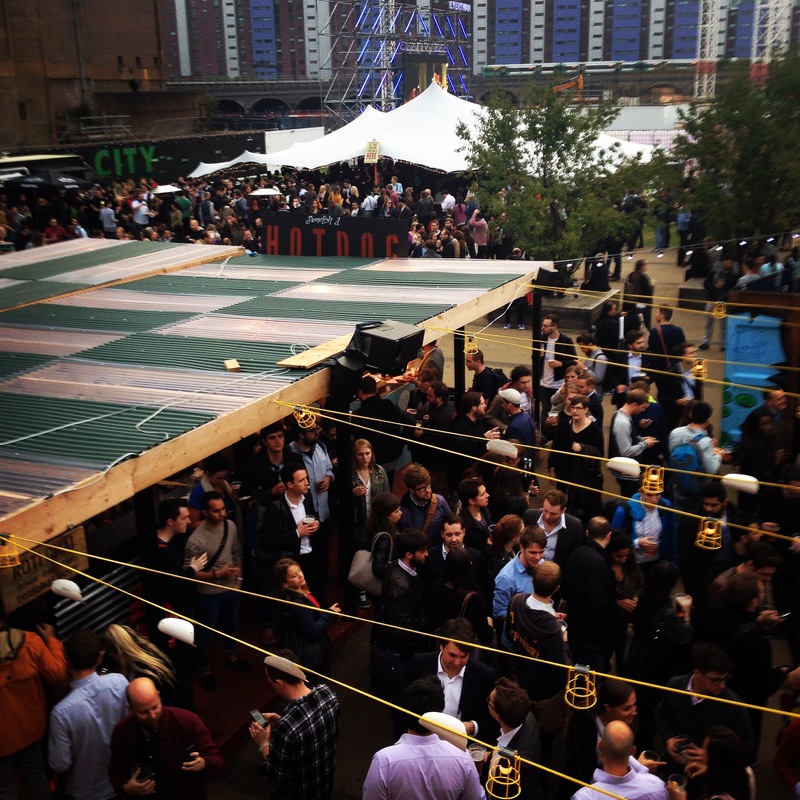 Mr Hyde and Tweat Up hosted this year’s National Burger Day at Battersea Power Station Pop-Up Park. 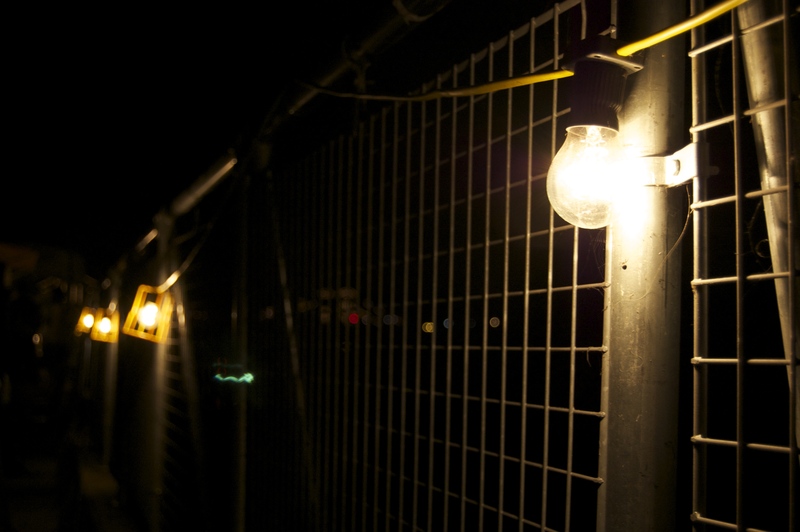 I’ve been unintentionally quiet on the old blogging front recently. But I’m going to make up for it today with the most mouthwatering, burgerlicious post yet. Wednesday 27 August was Mr Hyde’s second #NationalBurgerDay. Who’s Mr Hyde I hear you ask and what the heck is National Burger Day? 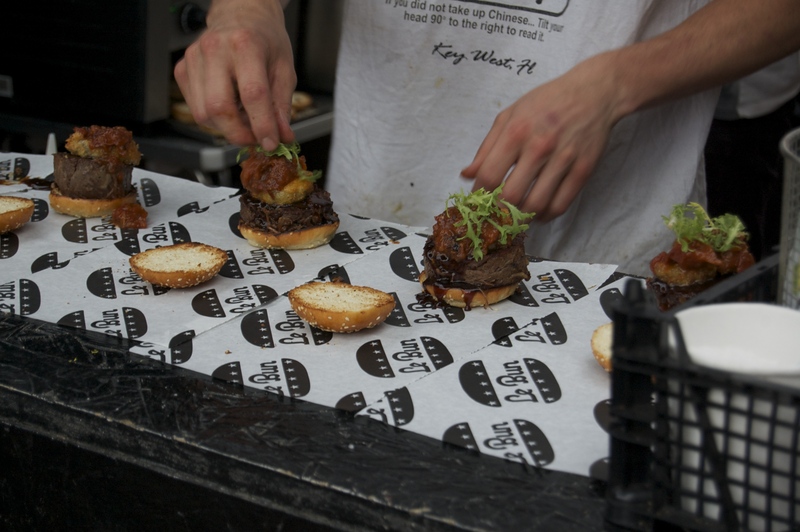 Mr Hyde is the award-winning daily email which showcases London’s best pop-ups, exhibitions and restaurants (from the makers of ShortList) and #NationalBurgerDay is a prestigious day invented to celebrate the beefiest, juiciest and tastiest burgers this nation has to offer. 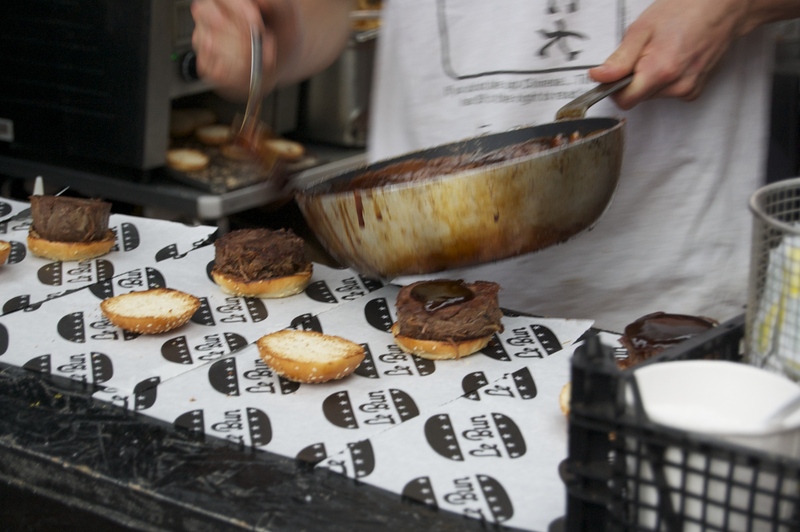 Yesterday’s event featured 12 of the biggest names from across the World of Burger including ze French, Club Gascon, America’s Bleecker St. Burger and Indian Roti Chai. 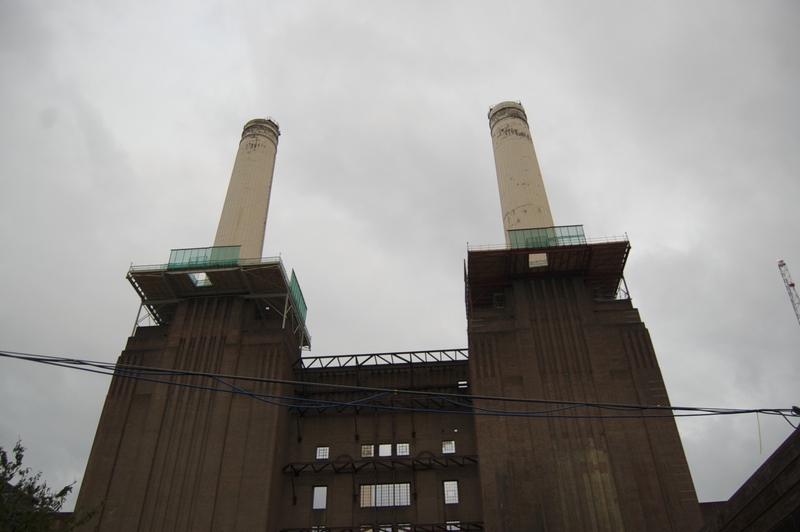 Stomachs rumbling in anticipation we arrived at Battersea Power Station Pop-Up Park for 6.30pm. The party kicked off at 5 but with lights out at half 11 we thought we’d be grand with a decent 4-5 hours of burger eating ahead of us. 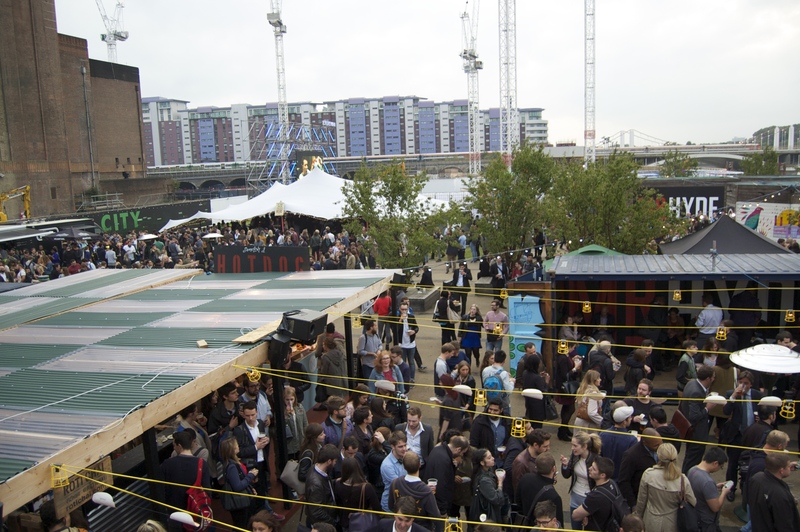 The street-food venue (home to Riverside Feast) was buzzing with fellow foodies. Understandably the queues had started to grow from stall to stall so we decided pick to our first victim and get in quick! Tonight’s menu was as unique as ever with most vendors offering a special for the night or one of their best sellers. 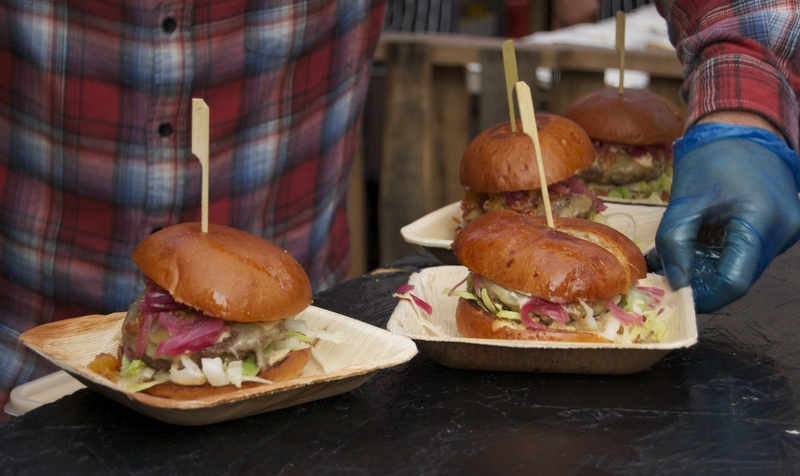 Burgers were served by the slider or half-burger, giving you a sporting chance of tackling four or five in one evening. 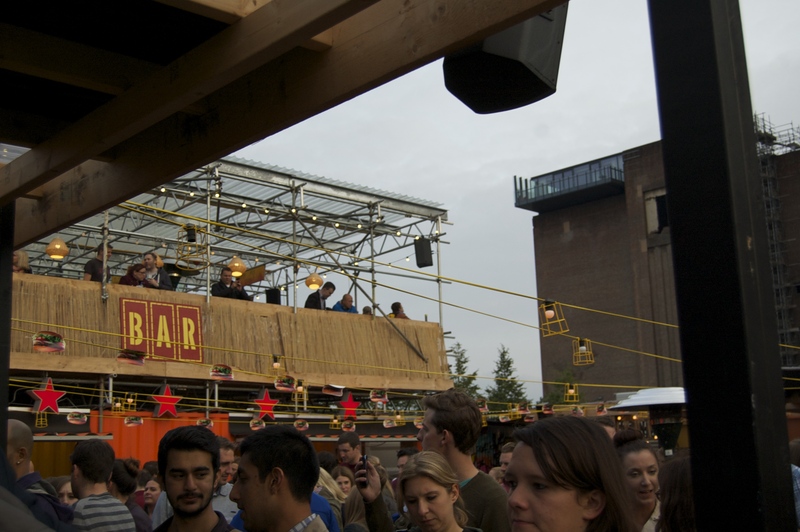 Included in the ticket price of £15 was entry, a pint of Meantime Brewery Fresh London Lager, a Jameson Pickleback and a Breddos #Chilliback with Jose Cuervo. To my regret, it would be impossible to sample all 12 burgers on offer so before I arrived I’d planned which ones I just HAD to try. 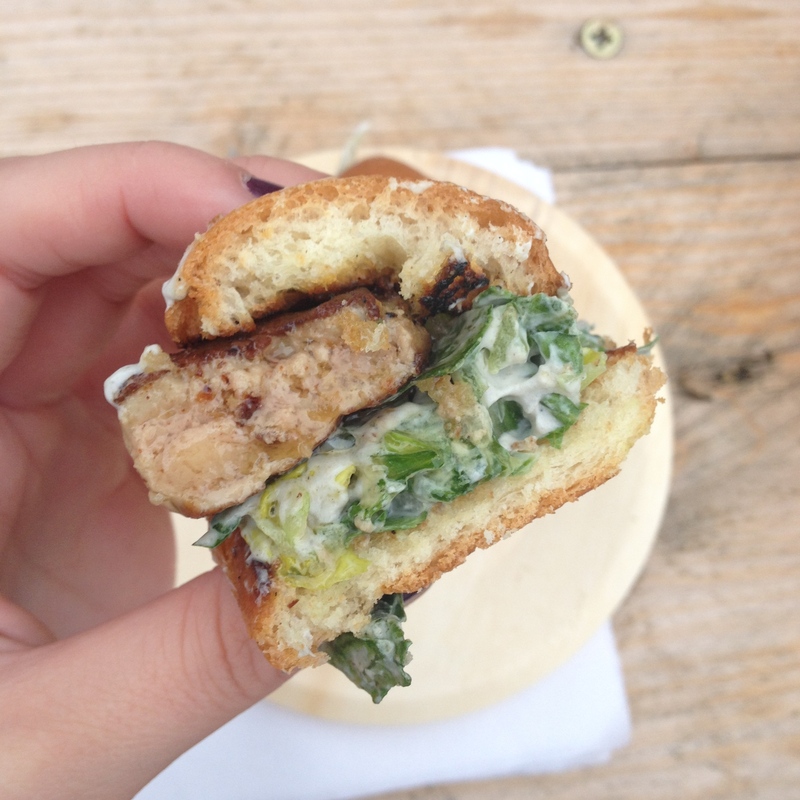 First on the hit-list was Club Gascon’s Foie Gras and Summer Truffle Burger. 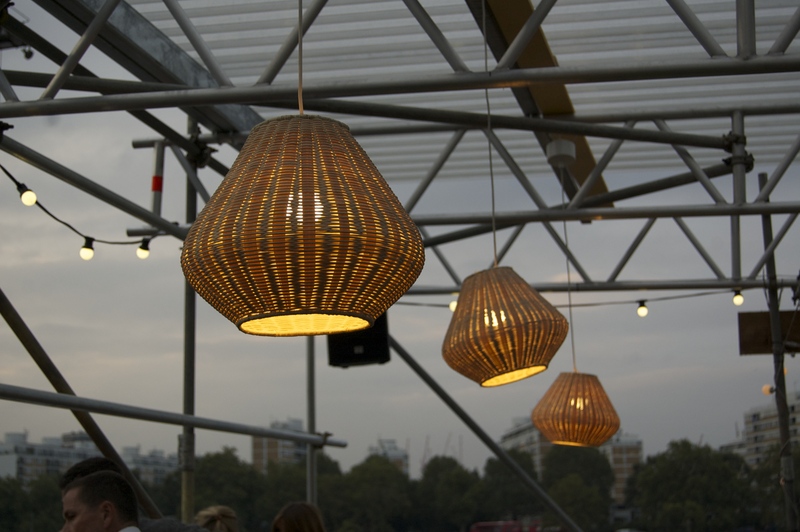 Club Gascon is a French restaurant located in West Smithfield, London. As of 2013, the restaurant holds one star in the Michelin Guide. I must be honest and tell you that I hadn’t actually heard of Club Gascon before, but when I saw the pan fried foie gras burger hidden amongst the beef patty’s on the menu I thought I had to try it. Served in a thin brioche bun the pan fried foie gras dripped grease over a layer of baby gem lettuce, mixed with truffled cream. It was a very gluttonous burger, the oily and greasy liver dripped with sin. Foie gras is Club Gascon’s specialty, and my god would I recommend it. Divine! 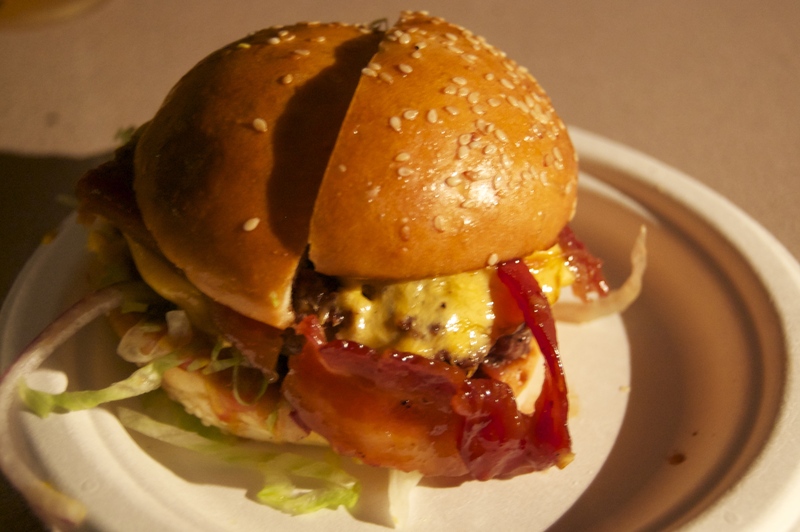 Shortly after, we joined the queue for a Bleecker St. & Mr Hyde Pizza Burger. Bleecker St. Burger is owned and run by Zan Kaufman, who swapped practising law in New York City for serving up fantastic burgers on the streets of London. Bleecker and Mr Hyde co-created a burger especially for #NationalBurgerDay, comprising of a 50 Day Dry Aged Patty, Melted Mozzarella Cheese, Nicky’s Marinara Sauce, Grated Parmesan, Basil Mayo and Red Pepper Flakes. 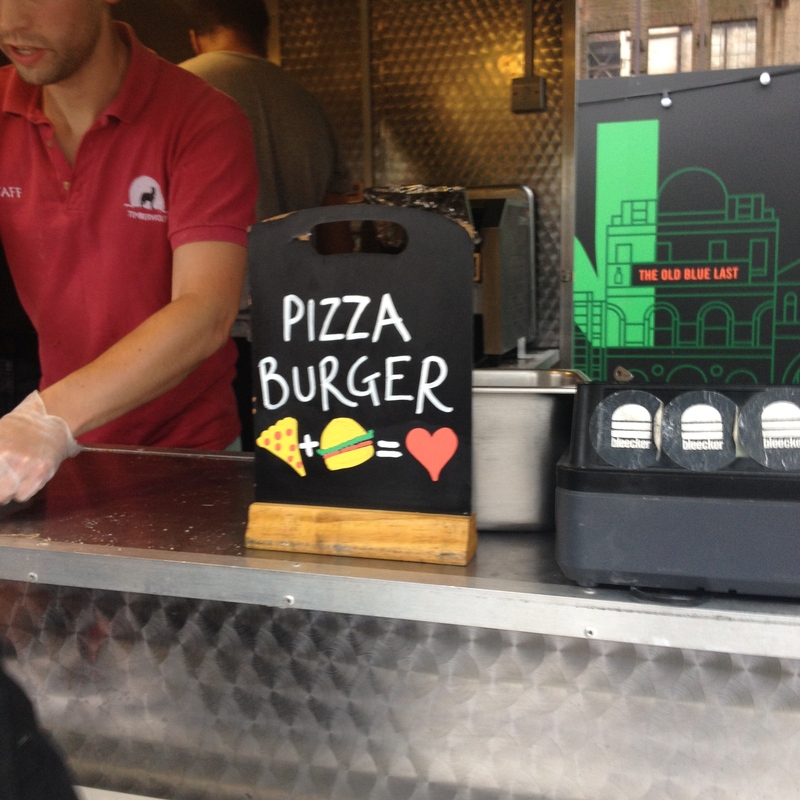 Available for one-day only, the pizza burgers were served as sliders for £5 each. 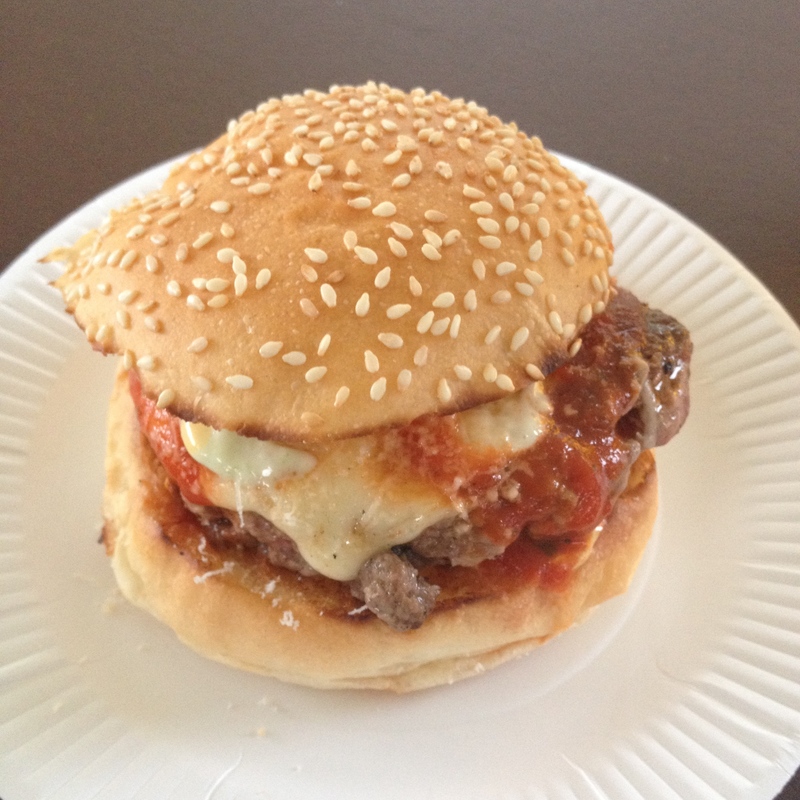 The patty was medium-rare as expected, crowned with a layer of melted mozzarella and kept warm with a dollop of freshly made marinara sauce. Something had a slight kick to it, I wasn’t sure whether it was the marinara or the red pepper flakes. Either way, everything complimented one another and each mouthful was beautiful. 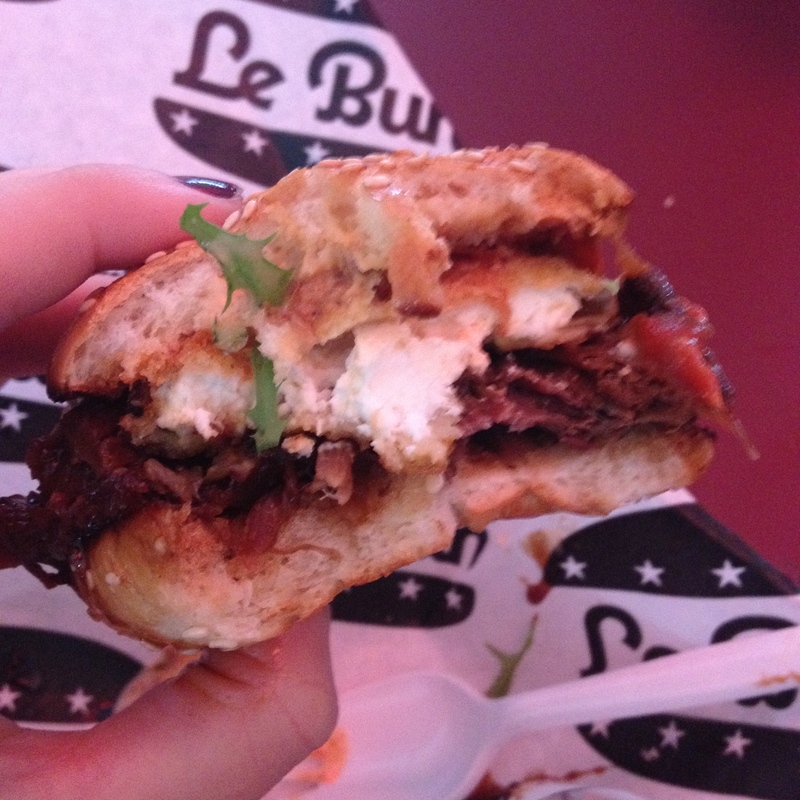 Next up: Le Bun. Oh my god. Instant favourite. The Le Royal with Cheese Slider was incomparable – one eight-hour slow-cooked short rib patty served with hickory beef jus, cheese and smoked tomatoes. Seriously this wasn’t any old burger. To start, the cheese came in the form of deep fried St. Maure de Touraine, the king of goat cheeses. 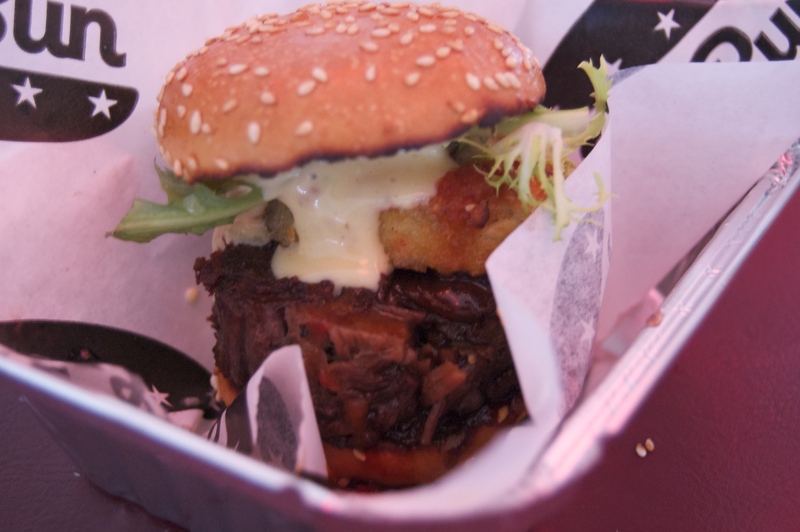 The short-rib beef was dense and cleverly compacted into a patty, the hickory beef jus was smothered over the meat – the whole thing was just immense. Fourth in line was Disco Bistro. I’ve always wanted to try one of their burgers, after all they were the winner’s of the BurgerMonday Championships. Tonight’s burger, the Roller Disco Burger featured dry aged Dexter beef, bun sauce, mature cheddar, pickled onions and pineapple bacon jam. I was most excited for the pineapple bacon jam as I love the combination of sweet and savoury flavours. The pickled onions were bright purple in colour and added a tang to the ensemble. I wasn’t blown away by the patty, for a start it wasn’t pink and I definitely couldn’t taste any mature cheddar in there either. A good effort, but against the rest of the competition in the room it came out at last place for me. The final burger of the night for us came from none other than Mother Flipper. They had the biggest queue all evening, which was a little off putting – but at the same time we’re British so obviously felt inclined to join the rest of the sheep in the pen. 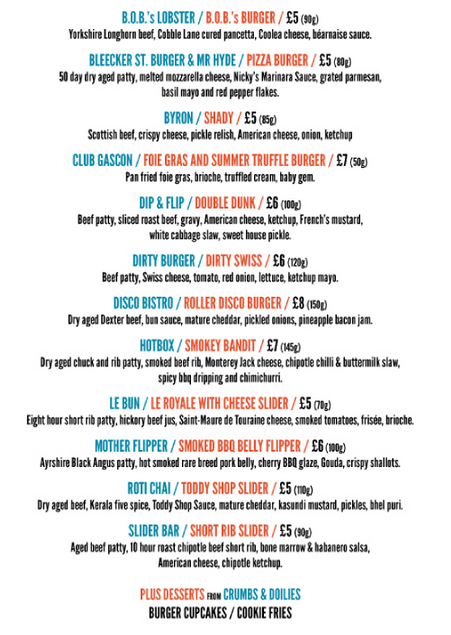 The Smoked BBQ Belly Flipper married an Ayrshire Black Angus patty with hot smoked rare breed pork belly. 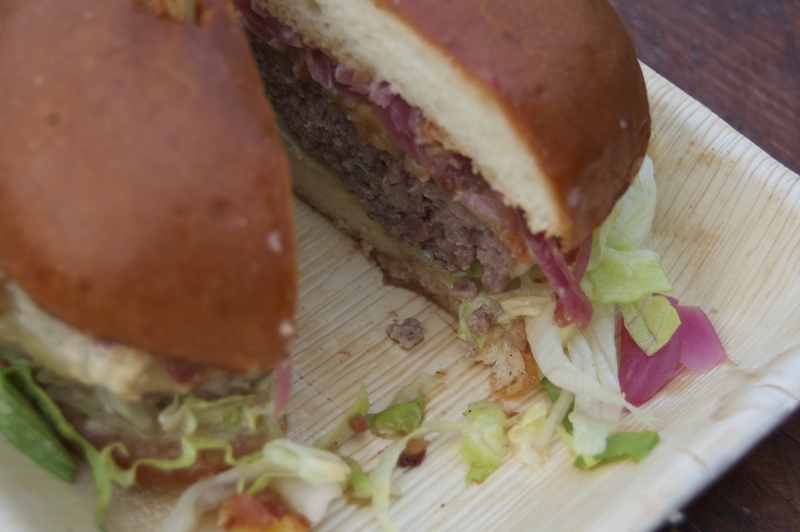 Mother Flipper add their patties to the grill as a ball to lock in all the juices before squashing into a burger shape. Drizzled with a cherry BBQ glaze, Gouda and crispy shallots – it was a wondrous thing. The angus beef and pork belly were delicious – as the sweet glaze and the nutty, mild Gouda cheese ladened the meat. Top notch. 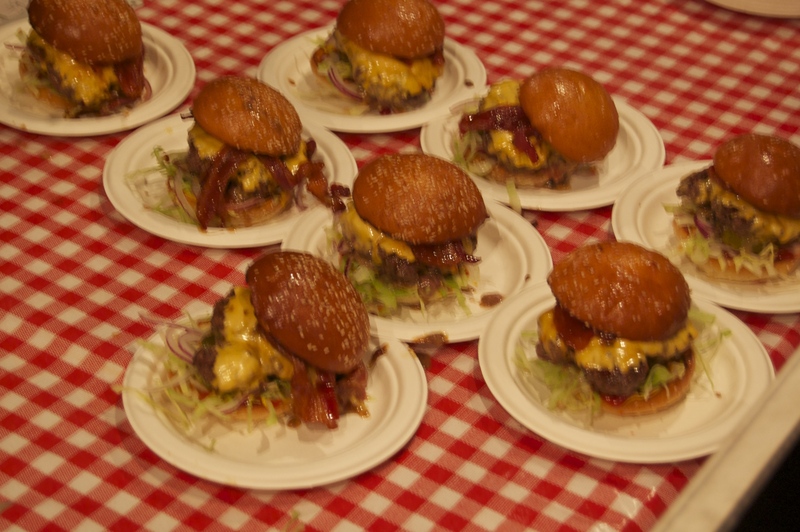 If I had the ability (special powers) to try all 12 burgers last night I would have done. Alas I’ll have to save B.O.B’s Lobster, Byron, Dip & Flip, Dirty Burger, Hotbox, Roti Chai and Sider Bar for another day.